MYRRH from Biblical stories, as it's one of the precious gifts (together with gold and frankincense) offered by the wise men to the newborn Jesus. o To extract myrrh, the bark of the tree is cut, and a yellow sap comes out. - This sap dries into reddish-brown, walnut-sized lumps, with a unique sweet and smoky aroma, that are then used to make myrrh oil. - Myrrh oil has a golden yellow or brownish color, and a rich, smoky and balsamic aroma. - Myrrh essential oil do not allow microbes to grow or infect your system. - It can be used to prevent any ailment resulting from microbial infection, such as fever, food poisoning, cough & cold, mumps, measles, pox and infections of wounds. - It has no adverse side effects, unlike other antibiotics, such as weakening of liver, or digestive malfunction. - Myrrh essential oil acts as a fungicide as well. It can be used either internally and externally to fight fungal infection. - It fights the viral infections that can cause coughs and colds, as well as relieves congestion and reduces the deposition of phlegm in the lungs and respiratory tracts. o antispasmodic properties...Google for more information. 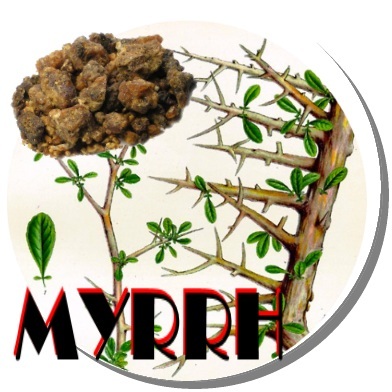 Respiratory problems - Myrrh oil works well against coughs, colds, and sore throat. It also helps relieve congestion and expel phlegm. Digestive ailments – It promotes digestive health and helps cure problems like stomach upset, diarrhea, dyspepsia, indigestion, flatulence and hemorrhoids. Gum and mouth diseases – It helps relieve toothache, gingivitis, and mouth ulcers, and also freshens your breath. Myrrh oil is even used as a natural ingredient in mouthwashes and toothpaste. Immune system health - It strengthens and activates your immune system to keep your body protected from infections. o Frankincense, Lavender, Patchouli, Rosewood, Sandalwood , Tea Tree, Thyme. o It was extensively brought to use by the ancient Chinese (called mo yao in China) and Egyptians. The Egyptians used it as a part of sun worshipping custom and for preserving mummies as well. The oil has also made its way in the making of cosmetics. While, the Greek soldiers used it to heal the wounds. o Athlete's foot, bronchitis, chapped skin, gums, hemorrhoids, itching, mouth, ringworm, toothache. o Myrrh is antiseptic and has been used to fight gum disease and yeast infections for a long time. The essential oil seems to improve the immune system and help defend against other illness causing microbes. Myrrh essential oil seems to be antiseptic, but also acts as a preservative and astringent helping to prevent wound infections when used to rinse cuts and scrapes. o High dosage of Myrrh oil can be toxic for health. Therefore, pregnant women should refrain from its use.